Meaty. Smoky. Juicy. Tender. And EASY! 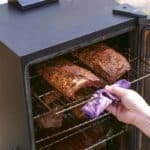 Cook delicious EASY Smoked Baby Back Ribs with just three simple steps in your electric smoker! My hubby got a new toy last year—an electric smoker—and we’re all enjoying his outdoor cooking adventures. We’ve sampled smoked turkey for Thanksgiving, smoked chicken wings for football season, smoked beef jerky, and now smoked ribs! After a full week in the office, we love getting outside so this time of year you’ll find us grilling—and now smoking—several times a week. Today, I’m sharing a simple three-step Easy Smoked Baby Back Ribs recipe for the electric smoker. Besides the meat, all you need is olive oil, seasoning salt, and a good maple or applewood flavored grill rub like Grill Mates Smokehouse Maple. Trim the fat from the ribs (if necessary) and rub 1 tablespoon of olive oil all over each rack of ribs. 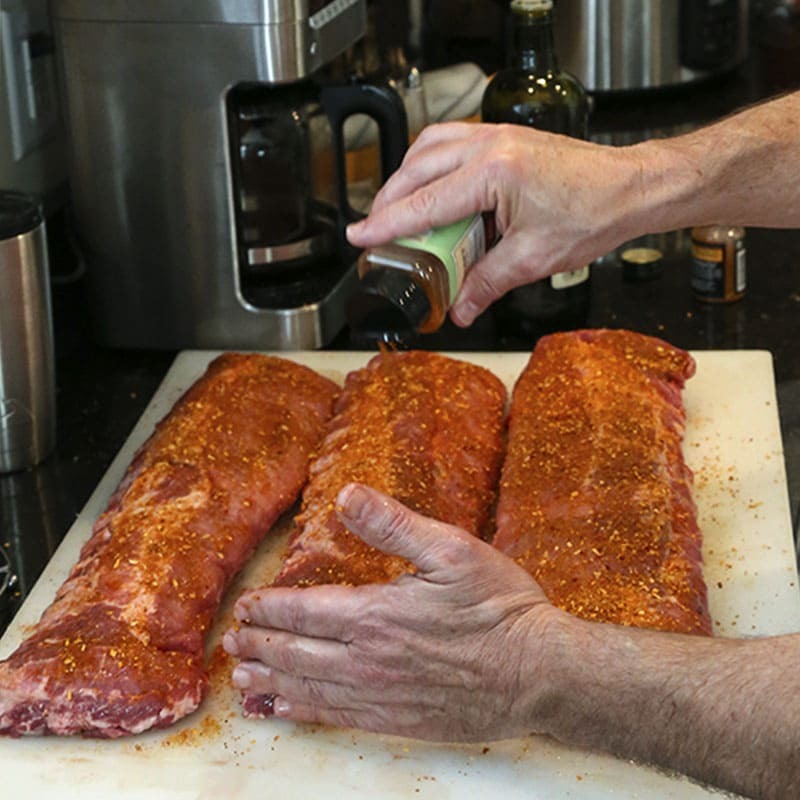 Sprinkle the ribs liberally with seasoning rub and salt, about a 2-to-1 ratio, on both sides. 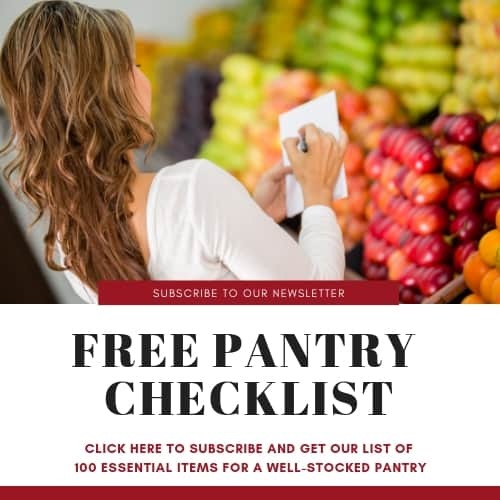 Wrap each rack tightly in plastic wrap and refrigerate for 24 hours, or overnight. Set the smoker to 225 degrees. Add soaked hickory wood chips in the bottom of the smoker (follow your manufacturer’s instructions). 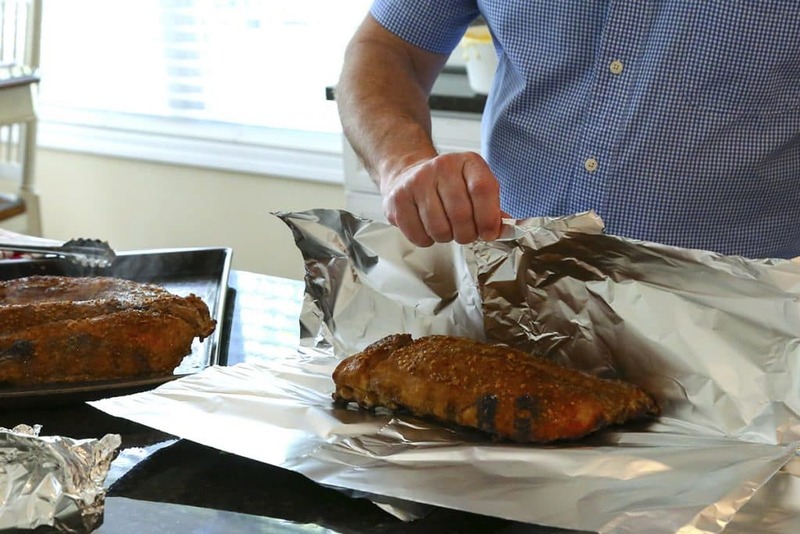 Unwrap the ribs and place evenly on the racks of your electric smoker. Close the door and cook for three hours. Be patient and enjoy the aroma coming from those ribs inside the smoker! 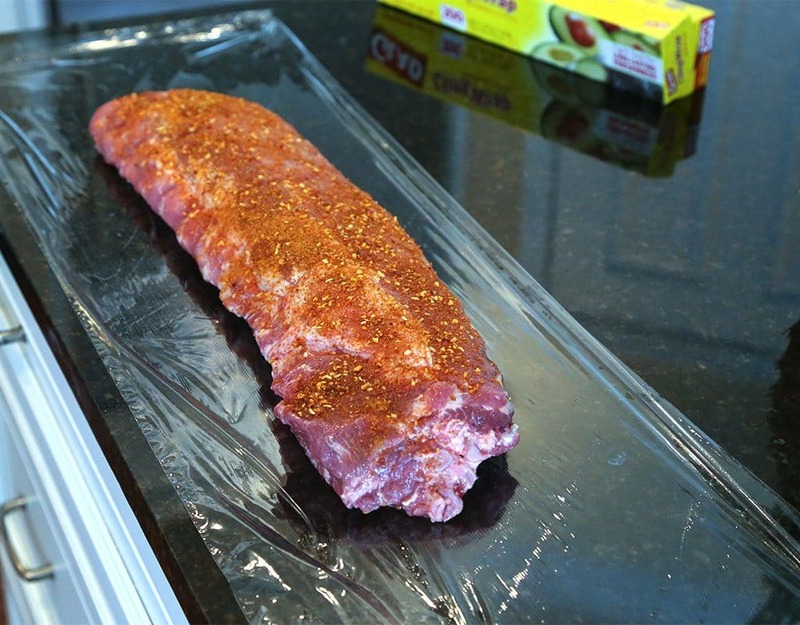 Remove the ribs and wrap each rack tightly in aluminum foil. Return to the smoker and cook for one more hour. Remove the ribs and cut into sections with one or two bones each and serve with your favorite barbecue sauce for dipping. Follow these easy steps and experiment with different sauces and rubs to find your favorite combination. Enjoy cooking outdoors, friends! 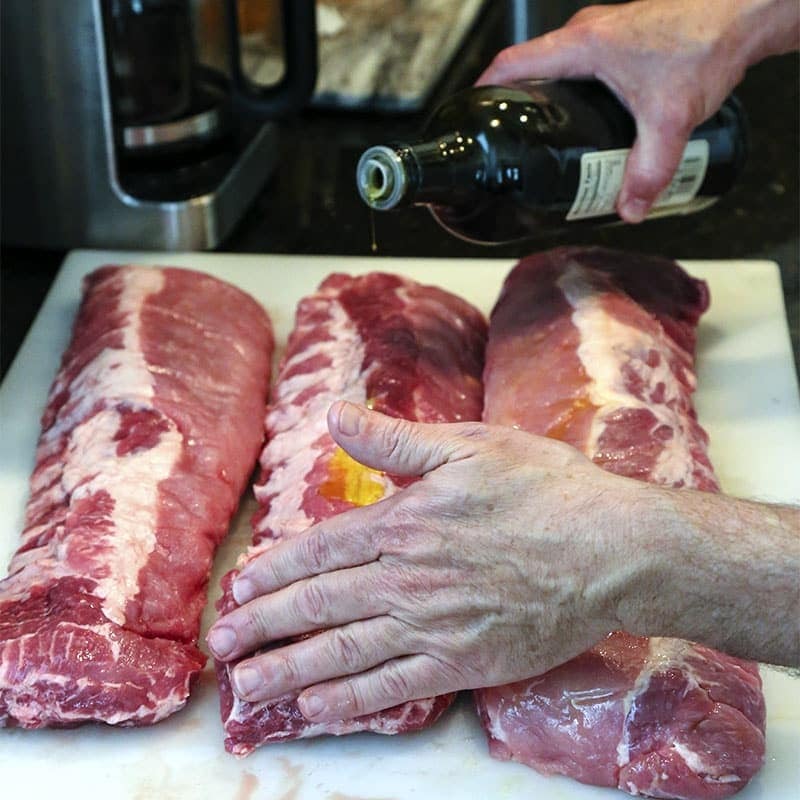 Rub each rack of baby back ribs with about a tablespoon of olive oil on both sides. Liberally sprinkle with smokehouse maple seasoning and seasoning salt. (The ratio of seasoning to salt should be 2:1.) Wrap tightly in plastic wrap and refrigerate for 24 hours. 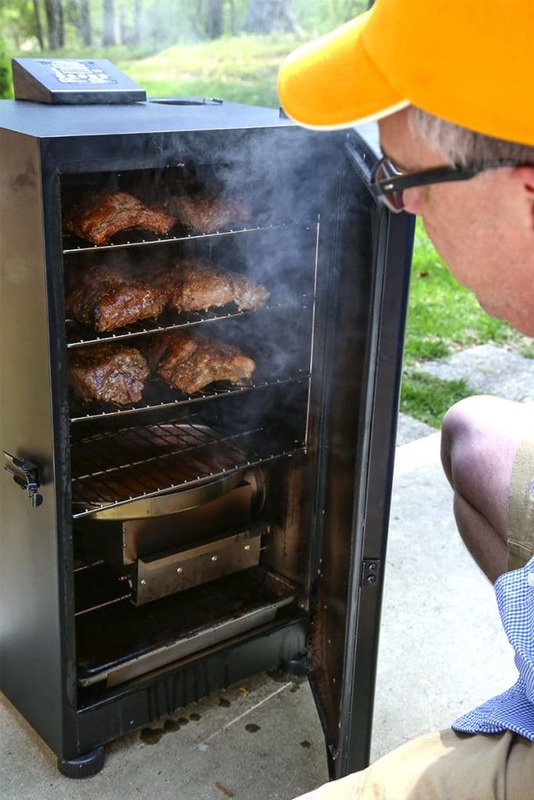 Preheat electric smoker to 225 degrees. Add hickory wood chips (follow your manufacturer's directions). Unwrap ribs and place evening on racks in smoker. Cook for 3 hours. Remove ribs from smoker and wrap tightly in aluminum foil. Return to the smoker and cook one more hour. 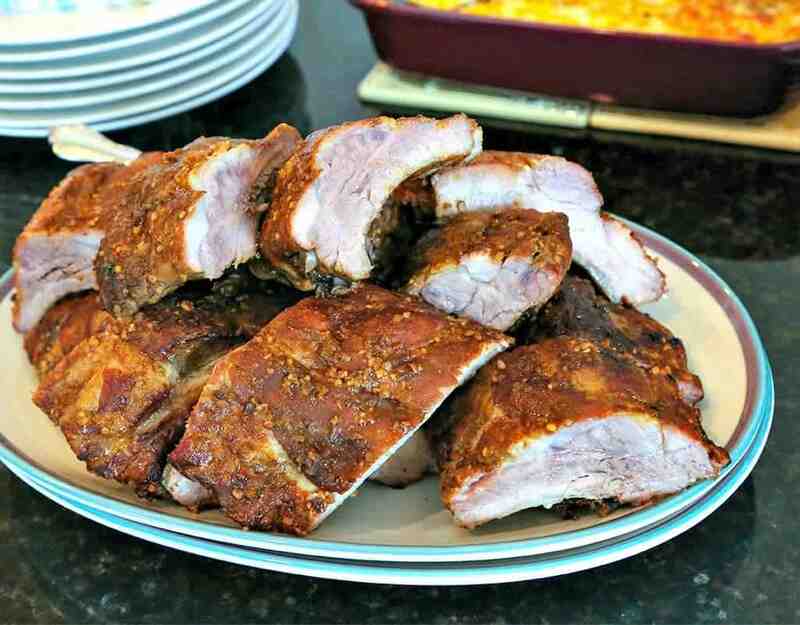 Remove ribs from smoker and serve with barbecue sauce for dipping. Been cooking ribs for a while in smokers. Going to use your recipe this weekend. I just realized that the olive oil will help keep the ribs moist. Letting them soak it in for 24 hours is a great idea. Thanks for your very nice looking blog. It’s not all congested with a hundred ads and things. I have that same smoker by Masterbuilt and love the thing! It’s Model 20070910. Great little smoker for the money. Marc, thanks for the compliments! 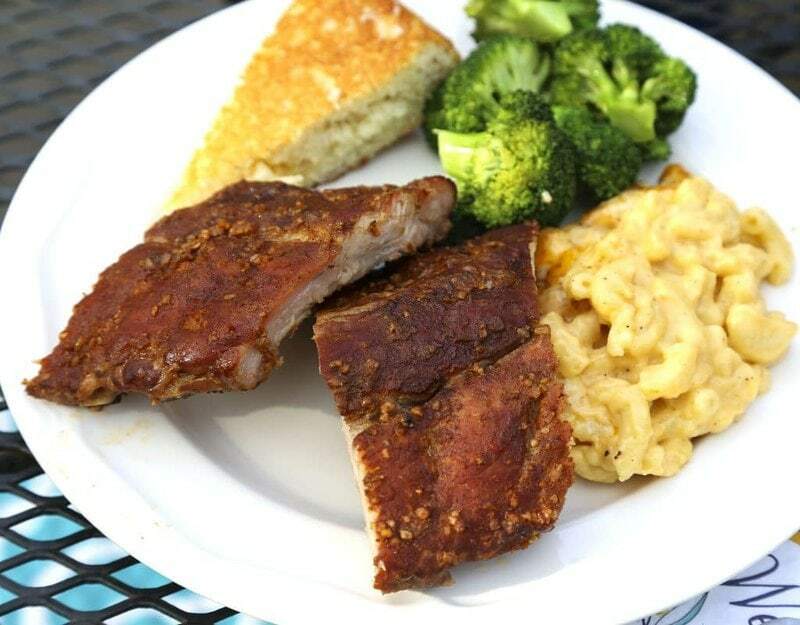 We love our smoker, too, and hope that you enjoy the ribs! I have a Masterbilt smoker like yours. I prefer my Hasty Bake but have the Masterbilt does a reasonable job and sure is easy. Only serious problem with the Masterbilt is that the racks are too narrow to accomodate a full side of ribs. It looks like you addressed that by cutting the racks in half. 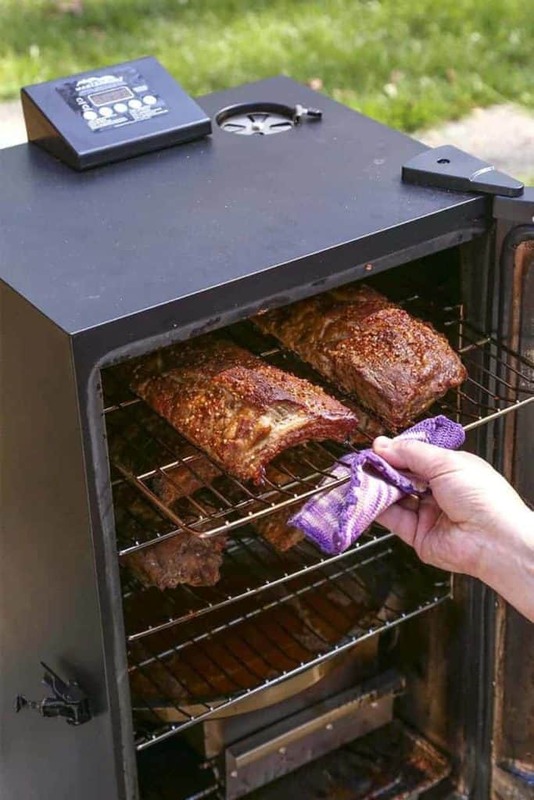 I would add that it helps to put a pan of water, beer or apple juice under the ribs. Isnt there salt in that seasoning already? 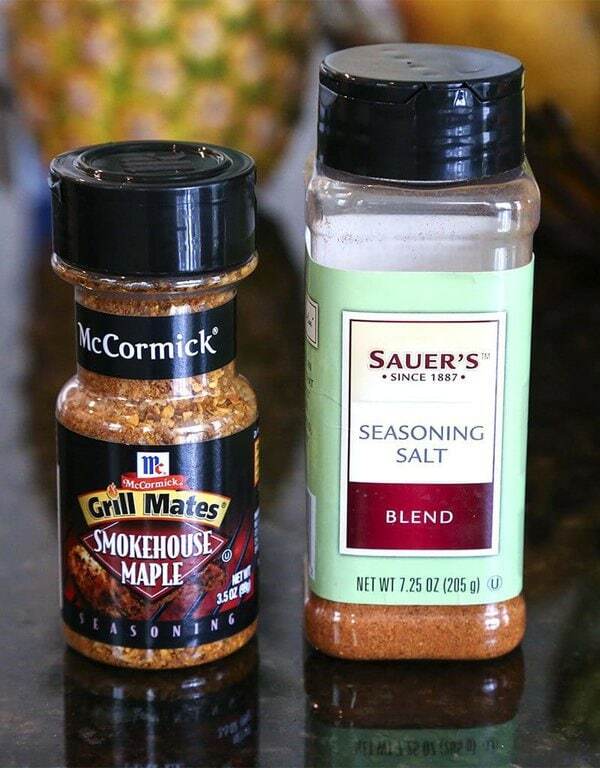 There is some salt in the maple seasoning, but more seasoning salt here acts as a tenderizer as well. Simple and easy, very well suited for rookies like me..
Ben, ribs should cook until they are tender. At an internal temperature of 145° F the ribs will be done, but may not be as tender as you like. If desired, once that temp has been reached, cook a little longer for tenderness. Was looking to try your recipe and noticed a typo concerning which wood to use. Is it Apple or Hickory? Your recipe is reflected below. 5.Preheat electric smoker to 225 degrees. Add hickory wood chips (follow your manufacturer’s directions). Rick, thanks for noticing my discrepancy — the recipe should have stated hickory chips and I’ve corrected it now. Hope you enjoy smoking some ribs this weekend! Todd, that’s awesome! We fired up the smoker and had ribs for our family’s July 4th celebration as well–good eatin’! I’m interested to hear more about that smoked mac ‘n cheese…sounds amazing! Question – should the ribs be falling off the bone? I made this and the meat wasn’t. I am just curious how yours turns out. I prefer falling off the bone. I followed the recipe exactly. Thanks in advance! Melissa, at an internal temperature of 145° F the ribs will be done, but may not be as tender as you like. If desired, once that temp has been reached, cook a little longer for desired tenderness. I will be trying your tips and tricks this weekend on a couple racks! Great simple easy to follow recipe. Thanks much in advance, as I anticipate no issues doing it “your” way! Curious why you remove and wrap in foil rather than letting the smoker maintain temperature and just keep smoking? 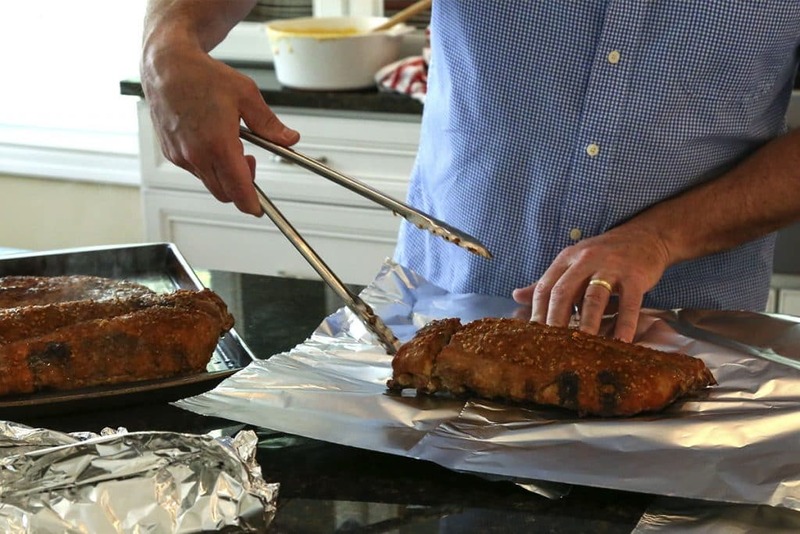 Craig, wrapping in foil allows the ribs to steam, creating more tenderness. This was my first attempt at ribs. I followed the recipe to the letter. The ribs were moist and tender. Wonderful flavor ! Firm believer in your rub recipe! The life seems so easier with an electric smoker. I love smoked back ribs, but still deciding to buy or not. 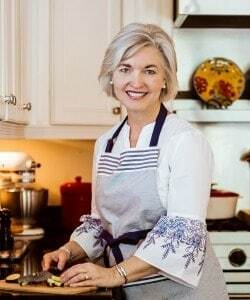 After your recipe, I think I have to have one! This makes my stomach growl! Looks delicious! Thank you so much for sharing this recipe. Trying your Rib recipe now, hoping for great results!! Great simple recipe. Mine came out great except O should have been more generous with the rub. Very moist and tender.